From the Himalayan regions near Tibet, this bowl was created for local use, and left in its original imported condition. Hand hammered, old, and unpolished with wonderful hammer marks and beautiful bronze patina with plenty of spotting and good wear. Multi-layered tone lasts as long as 3 minutes. Hand-made in a combination of 7 metals (gold, silver, mercury, copper, iron, tin and lead), which combine 7 distinct tones beautifully.Our bowls are tested and rated from 98.4 to 99.5 in quality of resonance and sound. Excellent for use in meditation, relaxation, Yoga, Reiki, healing, stress reduction and massage. 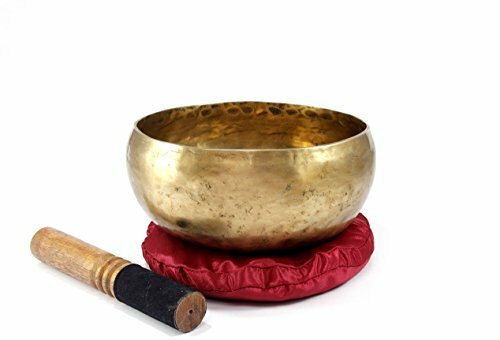 Magnificent singing bowl comes with cushion and dual purpose striker, with felt on one end and bare wood on opposite end. View More In Hand Percussion.